In a time almost forgotten, troupes of performers criss-crossed rural America presenting repertoire theatre. From the 1850s to the 1950s, five generations reveled in the clean fun and sociable respite offered by these traveling companies. These versatile "troupes" entertained audiences with comedy, farce, Broadway hits, adapted classics and suspenseful mysteries in settings that ranged from small-town opera houses to empty-lot tent theatres. Years ago Neil & Caroline Schaffner started collecting memorabilia from this era of theatrical history. It was from this "seed" collection and the generosity of the Midwest Old Settlers and Threshers Association, Inc., that this remarkable museum was created in 1973 at the crossroads of the Midwest, in Mt. Pleasant, Iowa. Since then, hundreds of troupers and their families have donated artifacts to make this amazing theatrical collection one of the largest of its kind in the United States. 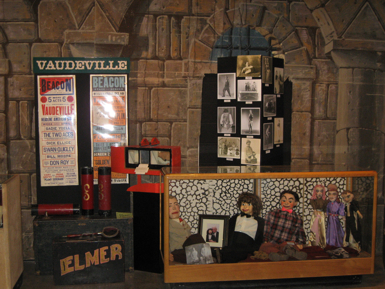 The Theatre Museum houses a most unique collection of memorabilia from early American popular entertainment. Priceless stage drops, quaint artifacts, a massive computer catalogued library, scripts and music scores dating from 1850s are arrayed for the curious visitor and the dedicated scholar. The photographs, show heralds, playbills, scrapbooks, newspapers, costumes and scenery are from touring companies that played in hundreds of American opera houses, town halls and tent theatres. 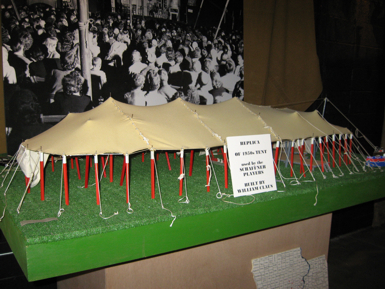 The collection also includes items from Chautauqua, showboats and minstrel shows. The National Society was founded to help administer and maintain the Museum. It's purpose is to preserve and perpetuate for educational and historical insight, the heritage, the memorabilia and the culture of tent folk and repertoire theatre and to provide a place for literary endeavors and scholarly research. Memberships to the National Society are $15 for a student, $20 for a single, $30 for a family, $50 for a Actors' Circle, $150 for a Directors' Circle, $500 for a Angel, $1000 for Gabriel Himself, all memberships are per year. Donations are welcome and greatly appreciated.